Gates has been increasing his wealth for several years in a row, but the corporate press continues to receive his bribes and then describes him as a giver. There is no lack of money in the world. Dozens of trillions of dollars are being hidden by very few people in offshore havens. It’s state-sanctioned looting. To quote some new statistics of interest from Oxfam (also co-opted by Gates), the world’s 85 richest people as wealthy as poorest half of the world [2-6] (i.e. 85 people have more wealth than 3.5 billion people combined). It’s not an accident, it’s like this by design. It’s a very bad design, and it’s reinforced by those in power — people who strive to continue to crush those at the bottom. Bill Gates invests in companies that are killing people (sometimes literally) and some of them, like Shell, also have former Nazi connections (see the latest [7,8] from a protest site against Shell for example, never mind the genocidal Monsanto, the violent G4S, and many more notorious companies that Gates invests in). Here in the UK (although it’s not unique to the UK) we are being incited against the poor and the foreign , despite the economic realities which say that the real problem is the looters at the very top. Some modernised countries are forced into poverty  by corrupt banks [11,12] that fund murderous companies, drug dealers, etc. (only to get away with it time after time). Some banks are now starting to charge for the privilege to take people’s money and lend it out — at high risk — to other people (even if the banks don’t really have this money) . New laws are being passed to better facilitate those who are oppressing in this age of unrest [14,15], protest against the banks are being labeled “low-level terrorism” by the FBI, and Gates himself is investing in companies that crush dissent and protests (like G4S). A lot of people don’t even have the time to study the situation , so they happily accept the fiction about crisis and the need to make compromises (like austerity). The super-rich are conspiring to lower our wages , driving many of us out of work  to making employment scarcity, then pretending to give handouts to the victims . In the UK, whatever is public is being privatised for a profit (creating new super-wealthy barons) , and making some wonder whether capitalism still works at all . Fortunately, Bitcoin emerges as a viable contender that even its rivals in the UK embrace . There is a lot of Bitcoin hype these days [23-27]. What’s more, here in the UK cooperatives are rising  (employees-owned companies), challenging the systemic tax evaders  and a broken economy  of financial apartheid  (huge gap between rich and poor). 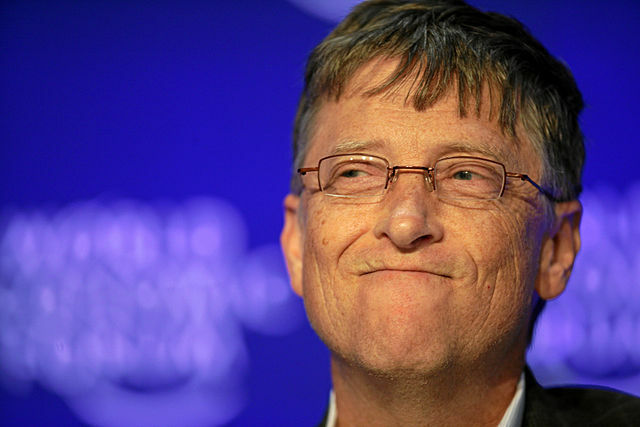 Last year Gates increased his wealth by $15.8bn and has now once again become the world’s richest man, worth about $78.5bn. He’s not alone – as a whole the world’s millionaires got 11% richer last year. For the rest of us, the decades-long trend of stagnating income continues. In some countries – Greece, Spain and Britain – median household income fell sharply. This week Gates is portrayed as a dreamy idealist, explaining to Davos seminars how ‘there will be almost no poor countries left in 20 years time’. Presumably this will happen with a lot of charity, but without minimum wages. Certainly Gates’ money will have significantly shaped the form which that ‘development’ will take, not least through the Bill and Melinda Gates Foundation. Forget democratic national projects, the world’s richest many will decide what sort of food you will eat and which corporation will supply your medical needs. Charities like Oxfam which talked about inequality did some essential work to frame the global context in which Davos takes place. But we need to do more than put these issues on their agenda. The corporate elite represented at Davos cannot be allowed to meet in luxury and pretend they have the answers to the world’s problems. They are the world’s problems. Gates has helped us unmask the true interests of the corporate elite. Further, this poorer “bottom half” now has about the same amount of money as the richest 85 people in the world, and the wealthiest grew their share of bounty in 24 out of 26 countries surveyed between 1980 and 2012, the study says. The research was compiled using data from Credit Suisse’s World Wealth report and the Forbes’ billionaires list. The report that everybody’s talking about this morning is Oxfam’s opus on global inequality, which leads with an eye-popping statistic: The richest 85 people in the world own more wealth than the bottom half of the entire global population. Since then the destabilisation of Royal Dutch Shell has gathered pace with the profits warning that shocked the markets on Friday. From what was stated in a Wall Street Article published yesterday, the new Chief Executive is likely to be receptive, as he apparently already had reservations about the “elephant projects” promoted by a previous Shell CEO, Jeroen van der Veer. The Public Power Corporation S.A Hellas (DEI) could not escape the tragic reality that the majority of Greek enterprises and households face every day. There is a deficit in DEI’s revenue due to unpaid bills, which reaches the amount of 1.3 billion euros. This amount is increasing every day by 4 million euros. The numbers: Ugly. Deutsche Bank reported a €1.2 billion ($1.6 billion) pre-tax loss for the fourth quarter of 2013. Analysts were expecting a profit of nearly €600 million, according to FactSet estimates. Revenues slipped by 16% versus the prior year. One achievement of which I am very proud was my part in ensuring that the UK did not place restrictions on the right to free movement of the first EU Eastern European accession wave. The arrival of so many Poles, Czechs, Hungarians, Latvians etc in the UK has been a brilliant social and cultural development and provided some support for an economy wrecked by the reckless greed of bankers. Wells fargo now charging for deposits! The material involved in our project includes more than 200 hours of footage of Austin and Beccy during their 100 plus day experiment of living on bitcoin. We also have between 50 and 60 interviews which we shot over the course of the project. Additionally, there are several more interviews which we are hoping to get to complete the story. Official worldwide unemployment climbed to more than 200 million for the first time last year, according to the International Labour Organization (ILO), a UN agency, underscoring the deepening impact of the global economic crisis that erupted in 2008. In its annual “Global Employment Trends” report, issued today, the ILO said an estimated 201.8 million people were jobless in 2013, up by nearly 5 million in one year. This is a new high, exceeding 2009’s record of 198 million. A New York City institution for promoting bitcoin has released proprietary hardware and software that enables developers to create and operate inexpensive bitcoin automatic teller machines. The Bitcoin Centre NYC, an educational institution for promoting awareness of cryptocurrencies, and its strategic partners released the hardware and software, in a move to open source every aspect of a working bitcoin ATM. By establishing democracy inside the enterprise, WSDEs make government responsible and accountable to the people as workers. Political democracy remains merely formal when governments’ direct dependence on people as voting citizens is not matched by governments’ direct dependence on people – in large part the same people – as workers. Real political democracy requires its integrated partnership with economic democracy as envisioned in economies where WSDEs prevail. Traditional socialisms’ over-emphases on macro-level differences from capitalism (substituting state-regulated or state-owned for private property and state planning for market exchanges) would be radically corrected by the micro-level transformation of enterprise organization from capitalist to WSDE. It’s a sight to behold. Just off Lagos, Nigeria’s coast, an artificial island is emerging from the sea. A foundation, built of sand dredged from the ocean floor, stretches over ten kilometres. Promotional videos depict what is to come: a city of soaring buildings, housing for 250,000 people, and a central boulevard to match Paris’ Champs-Élysées and New York’s Fifth Avenue. Privately constructed, it will also be privately administered and supplied with electricity, water, mass transit, sewage and security. It is the “future Hong Kong of Africa,” anticipates Nigeria’s World Bank director.